While by far the most common topic I write about on this blog is comics, I also try to, if not review, at least discuss the music that I love as well. Comics and music would be my two main hobbies, and I've often wondered at how infrequently the two are paired. 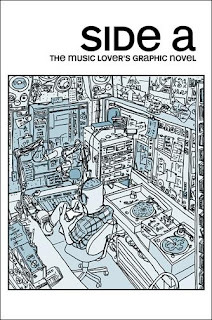 There are titles like Phonogram, CBGB, The Amazing Joy Buzzards, anthologies like the Tori Amos one, and, at the lower end of the spectrum, Dazzler and Wu-Tang comics, but it's rare to find an exploration of music in comics like the one completed by the thirty-odd cartoonists who contributed to Side A. This black and white anthology pulls together a large number of creators to share their love of music in comics form. The stories mostly take the form of memoir, although others are a little more fantastical in nature. There are a variety of forms and styles represented here, and I found that I quite enjoyed moving from one story to the next. I'm not sure that I'd heard of a single creator in this book before I picked it up, and while I'm not that tempted to check out the various websites listed in the table of contents, I liked being exposed to so many new voices. At the same time, a collection like this is just begging for work by people like Rick Spears, Vasilis Lolos, Becky Cloonan, Chuck BB, Brandon Graham, James Stokoe, Corey Lewis, or Rob G, to say nothing of Kieron Gillen and Jamie McKelvie. I found that there was perhaps too much representation of metal, making it harder for me to relate. For that reason, I loved the story about the guy who dumped a girl because she didn't know who John Coltrane was. I would have liked to see more hip-hop than a reference to Kriss Kross, but hopefully some of that is in Side B, which is on my pile of books to read.